Consider our office as an extension of your practice. When you refer your patients to us, you can trust that they are in good hands. Our goal is to provide your patients with the finest endodontic treatment available anywhere and to have them return to your office raving about the painless, thorough care they received from start to finish. We pride ourselves on a careful diagnosis. We take the time to get to the root of the problem and, if an endodontic treatment is not necessary, then the patient will not receive one. Simple as that. We take the time to carefully explain to the patient what the treatment entails and why we are going through with that particular treatment. Patients are encouraged to ask any questions they might have and, after our talk, we hope the patient feels a lot less apprehensive about the treatment. We always utilize the microscope at every stage of diagnosis and treatment. The microscope is invaluable to our practice. It allows us to visualize minute details of a tooth anatomy and is absolutely necessary for quality treatment and predictable outcome. There is also an assistant scope that allows the assistant to actively participate in delivering high quality care, which results in an improved experience for your patient. 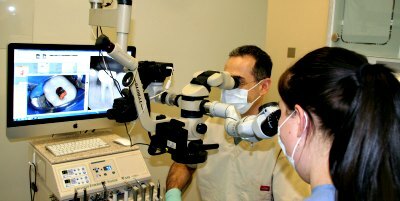 Advanced Endodontics utilizes superb radiographic and photographic documentation. Digital photos are continually taken through the scope in order to communicate the details of each case with you. 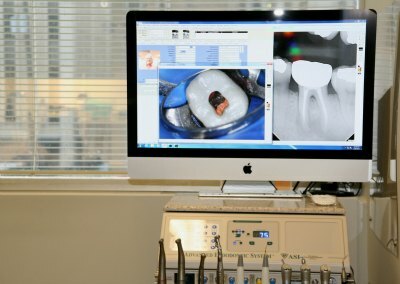 The radiographs and pictures of your patients, along with patient records and reports, are made available to you through our website. You can also communicate with us via phone and email. And if your patient is having an emergency, we will do everything we possibly can in order for that patient to receive timely care. If you have any further questions, please do not hesitate to contact us. We look forward to working with you! To refer a patient, please click HERE.